Home Car News Motor Shows & Events New York 2015 Range Rover SVAutobiography: meet the £150k Rangie! Range Rover SVAutobiography: meet the £150k Rangie! Land Rover has been steadily nudging the full-fat Range Rover upmarket for some time now. And every time they raise the price, they sell out. So here's the new 2015 Range Rover SVAutobiography, due to be unveiled this week at the New York motor show. It replaces the Autobiography Black. Cost? It's a cool £148,900. Yep, that's double the cost of the 'boggo' Range Rover, the 2016 model year of which goes on sale this summer for £74,950. SVAutobiography... is that a typo? Nope. You may prefer to call it the SV Autobiography for ease of pronunciation. Or maybe just SVA. The flagship Range Rover gets the most powerful iteration of the supercharged 5.0-litre V8 yet seen in the model, tuned here for a fulsome 543bhp and 502lb ft. While that might make sense in a Jag XFR or F-type, it's an extraordinarily colossal output for a tip-toeing luxury SUV. You'll spot the Rangie SVAutobiog-what-not by its optional duo-tone paintwork (pictured), quad exhaust pipes and unique front grille, finished in Graphite Atlas and chrome. What else do you get on SVO's first Range Rover? An exquisitely turned-out cabin, for one. Switches, pedals and finishers are now made from solid aluminium with tactile, knurled detailing, while the back seats look properly sumptuous, at first glance. This is Mercedes S-class-spec luxury and we'll be sure to try out the lazyboy powered rear-seat tables, fridge and solid aluminium coat hooks at the New York show debut this week. And has Land Rover been watching the David Brown Speedback? 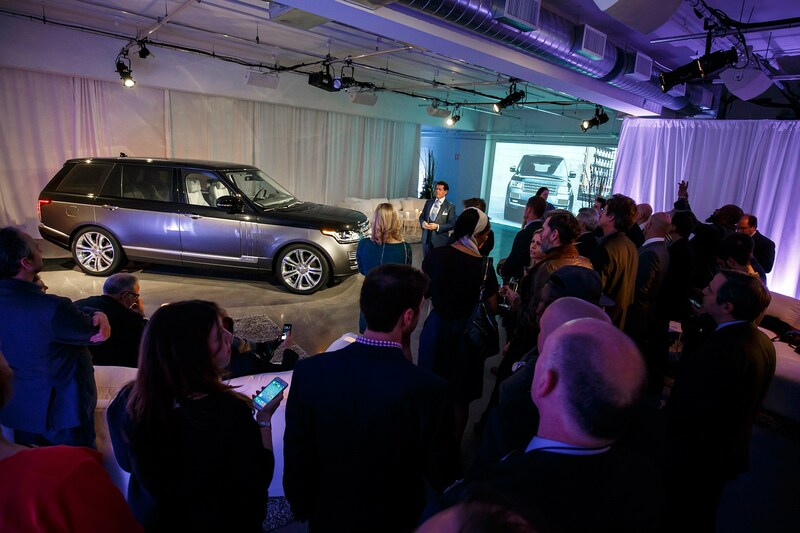 The Range Rover SVA comes with 'Event Seating.' The drop-tailgate lowers to include two posh picnic chairs trimmed in Windsor leather. The best thing since sliced bread, or would you just look a bit of a wally dangling your feet in these stirrups? Tell us in the comments below!